First time offered in 20 years. It is unique, it is unrivalled. A Residence of inspiration and unsurpassed grandeur. Breathtakingly executed to a finite degree. 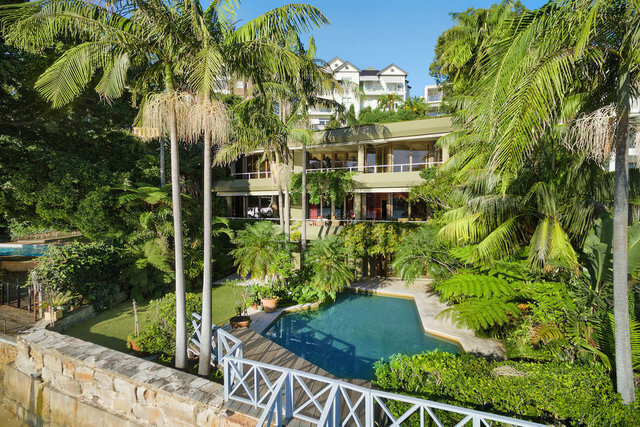 Set in a private oasis right on Seven Shillings Beach. Back dropped by idyllic Bay & Harbour views from the beach to the Opera House, Harbour Bridge and beyond. Accompanied by Sydney’s most coveted ‘Pagoda’ Boathouse and calm, deepwater berth for year round mooring. This masterpiece of residential architecture, designed by Richard Christian and Walter Barda, indulges every possible personal extravagance, need, whim and necessity. Detailed to an exceptional degree by Michael Love and Thomas Hamel, ‘luxury’ has been applied unstintingly to create a cocoon of extraordinary beauty. Every minute consideration is in place, not an inch has been overlooked in the quest for absolute comfort and aesthetic excellence. The mood is rich yet doesn’t intimidate, is substantial yet inviting and intimate, it is above all, a home. Remarkably secluded, it melts into the hillside affording those ‘in residence’ a haven of privacy from neighbours, beach-walkers or harbour-goers… yet from the grounds or interiors, the views are both intimate and spectacular, reaching into the bay and across the harbour. Tailored to an impeccable degree, positioned in Australia’s most exclusive enclave with unrepeatable waterfront facilities, this home is a once in a lifetime opportunity at an international level. • Bespoke handmade finishes and exquisite timber detailing throughout.